You need cookies. He wants cookies. She loves cookies. Satisfy those cookie cravings with our monthly subscription. Available in 3, 6, and 12 month packages. 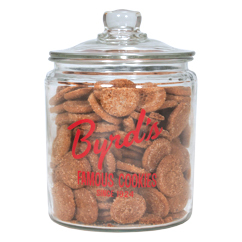 The first month's 1lb of cookies comes with our 20oz signature jar. Each additional month we ship a 1lb bag to keep that jar full, and make that nosey neighbor really jealous. All shipping is included in the price—so no surprises there! It's the gift that keeps on giving—May Your Cookie Jar never be empty… There's a different flavor every month!